I was kindly sent the DHC Resveratrol range to try out, which consists of a moisturiser, a lotion and an essence. I know, an essence – so exciting. My first essence? It’s early to say, but I am in love with this range. If you have dry/dehydrated skin like me… this is perfection. The lotion/toner is one of the most comforting I’ve ever tried – it feels fairly thick and manages to leave a slight film behind which isn’t sticky but just lovely. The essence is essentially a very moisturising serum – it leaves skin feeling soft and comfortable after use. The cream is very, very rich – it’s so buttery. I’ve been using it at night because I feel it would be a little heavy, for me, for day. It also has a bouncy texture, which is all kinds of amazing. When I use all three, my skin is so soft. Ah, amazing. The little inky blue pot is the much hyped Sunday Riley Luna Oil. I was so so intrigued, but was not prepared to drop a serious amount of money without even trying it first. 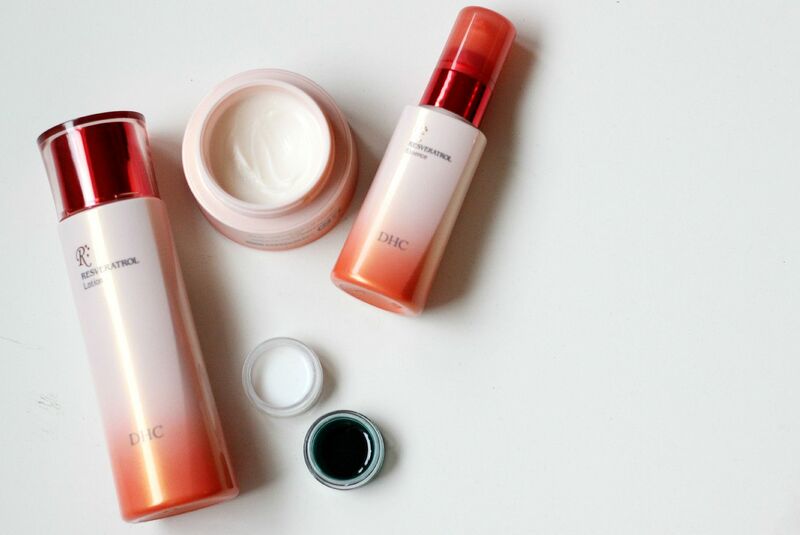 Space NK is always good with samples – maybe because I’m such a loyal customer – and a lovely lady in Brighton gave me a generous pot of it to try, as well as the also hyped Good Genes. Ahhh, so happy! I have been using the Luna oil every other night, and I haven’t noticed anything drastic – but I don’t ever really, with skincare. I will diligently use up my sample and then see if my skin has some sort of identity crisis without it. What skincare bits are you using at the moment?